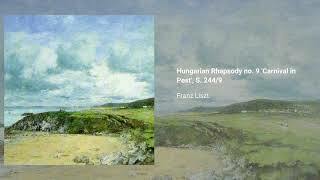 Franz Liszt wrote his Hungarian Rhapsody no. 9, catalogued as S. 244/9, in 1847. He nicknamed it Carnival in Pest (being one of the few rhapsodies he actually named) and, because of its particular blend of folk melodies and virtuosistic passages, it quickly became a staple of his repertoire. The work is in E flat major, and a standard performance lasts about ten minutes. Liszt himself wrote version for piano four hands and for a piano-violin-cello trio.